In 1981, a prominent San Antonio law firm hired a young attorney to help with one of their important clients—Southwest Airlines. The young attorney, Ron Ricks, had a general fascination with flight but no previous aviation legal experience. 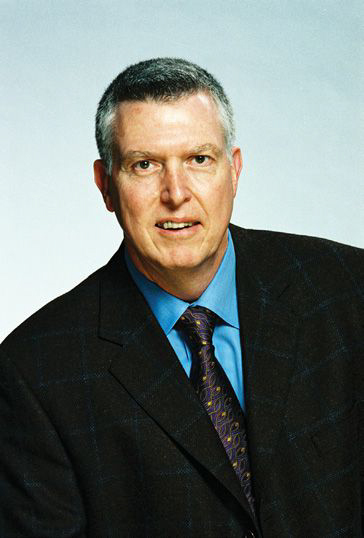 However, Ricks’ involvement with Southwest came just as the aviation industry was beginning a massive growth period following the Airline Deregulation Act of 1978. With deregulation, Southwest was poised to take its successful Texas-built model nationwide. With all these changes, Ricks’ role quickly escalated. Shortly after he started his new job, his boss, Herb Kelleher, became CEO of Southwest. Five years later, Ricks became a Southwest employee, too. “The timing for me was very fortuitous,” he said. 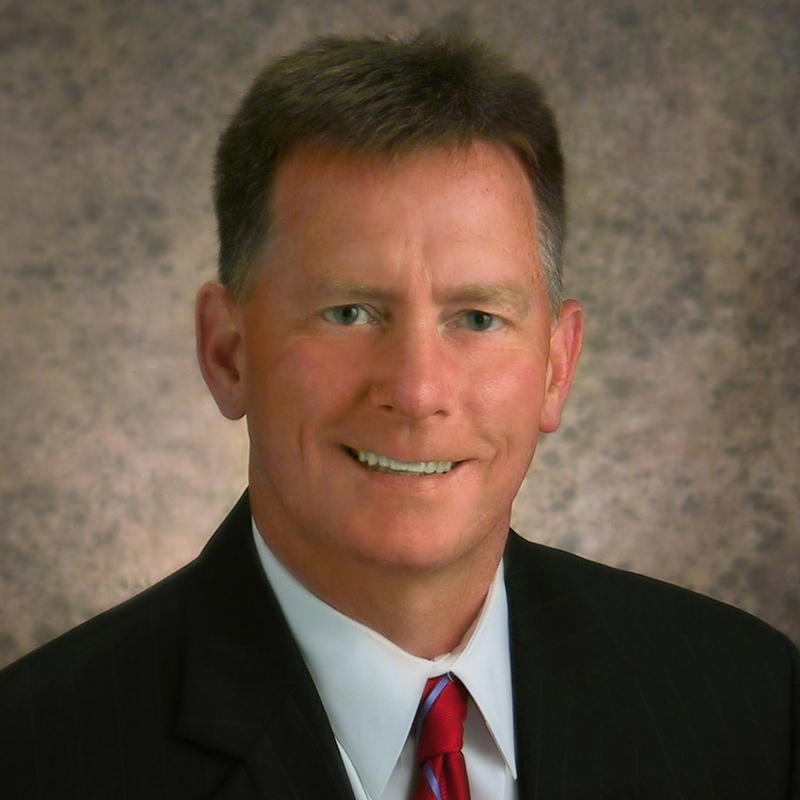 Today, Ricks is executive vice president and chief legal and regulatory officer at Southwest Airlines. One of the nation’s most admired businesses, Southwest also has a growing commitment to Missouri, where it has become the state’s largest air carrier. Missouri Business sat down with Ron Ricks to discuss the past, present and future of Southwest Airlines and air travel in Missouri. Missouri Business: Ron, thanks for joining us. Southwest Airlines has obviously seen tremendous growth and evolution since 1981, when you first became involved with the company. However, even in those early days, was there any indication to you that Southwest was headed for big things? Ron Ricks. Courtesy of Southwest Airlines. Ron Ricks: Yes, there was. Prior to 1981, the airline industry was regulated by the federal government with regard to economic regulation—meaning that if an airline wanted to fly to St. Louis, Kansas City or anywhere else, you had to seek permission from the federal government to do that. That process was very complicated, protracted and litigious. Before deregulation, Southwest had operated under the entrepreneurial idea that if you flew on an intrastate basis—for us, that meant entirely within the borders of Texas—you did not have to comply with federal economic regulation. It was a much simpler, much less controlled, much less contentious process. Southwest did that and it became successful. Operating outside the economic regulations made for a more efficient airline from a cost standpoint. 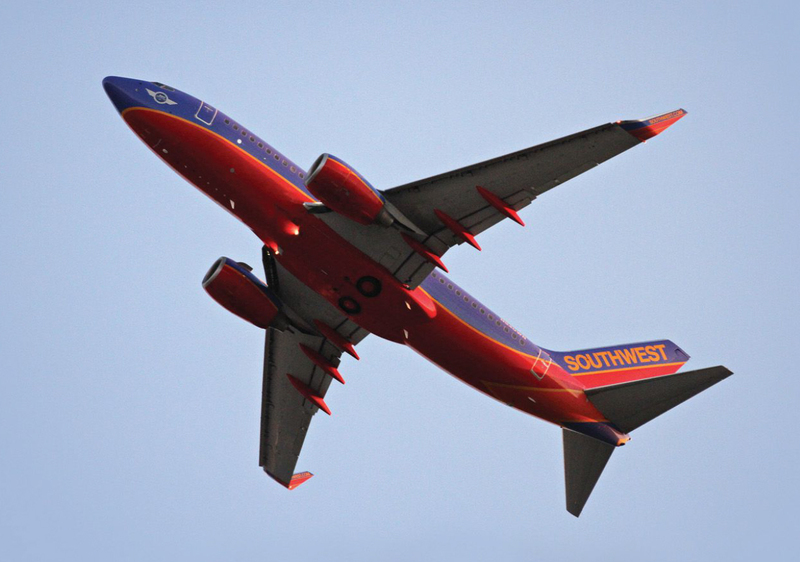 As a result, Southwest could offer more flights to more places at lower fares. That led to a boom in air transportation in Texas. That, in turn, was the case model for the United States Congress that led to the deregulation of the whole industry. Once that happened, Southwest Airlines could start growing outside of Texas. So what did I see in 1981? Southwest Airlines had a business plan to grow dramatically around the country based on the proven success of our business model in Texas. And I knew, from watching what Southwest had done in the state of Texas, that there was no reason why if it worked in Texas it couldn’t work someplace else. MB: That was right at the start of the aviation boom. That must have been exciting time in the industry. Ricks: It was. The early 1980s were an incredibly exciting time. It wasn’t really unlike what’s happened in recent years with regards to technology. The changes during that period made air transportation accessible, affordable and almost ubiquitous. Prior to 1980, only 15 percent of adult Americans had ever taken a commercial airline flight. Today, that number is over 85 percent. In that relatively short period of time, air transportation has, itself, transformed. It has also transformed the economy of America. In the early 1980s, a lot of what we see today was being created at a blistering pace. Then there was a 20 year run, not unlike what we’ve seen in the last decade with the growth of the internet. So, it was a growth story. They were extraordinarily exciting times. One of the reasons I look back upon that is I can realize why I’m so darn tired! MB: Southwest is often cited as one of the nation’s most innovative companies. How was that culture of innovation established? Ricks: You could ask that question to 100 people here at Southwest and they would answer 100 different ways. My answer is that in the early years, Southwest Airlines was confronted with enormous challenges—political, legal, operational and financial—which required, as a necessity, that innovation take place. Let me give you my favorite example. In the early 1970s, Southwest Airlines had four airplanes. Four. To put that in perspective, today we have 700. At that time, some of our competitors were engaged in anticompetitive practices aimed at putting us out of business. Two of them would later be indicted for criminal violations of federal antitrust laws. But at the time, Southwest Airlines was losing money; running out of money. And the decision was made to sell one of the four airplanes to raise cash to stay in business. However, here was the dilemma—if you only have four airplanes and you sell one, you’ve just eliminated 25 percent of your flights, right? If you eliminate 25 percent of your flights, you eliminate 25 percent of your revenues. If you lose 25 percent of your revenues, you’re out of business. So you haven’t accomplished anything. Solution: Operate the same number of flights with 25 percent fewer airplanes. How do you do that? The employees of Southwest Airlines—not management, not a consultant, not someone with an MBA—figured out a way to turn around the airplane more quickly so Southwest could operate more flights in the course of a day. Historically, in the airline industry, it took airlines 30 minutes to more than an hour to turn the airplane—unloading and boarding passengers, bringing on luggage and mail. Southwest employees came up with a way to turn an airplane in 10 minutes. That innovation allowed the airplane to be used more efficiently throughout the day so Southwest could operate the same number of flights you did with three that you did with four. When Southwest did that, the company became profitable. That was 1973 and the company has been profitable every year since. That kind of employee innovation became part of our culture. Creativity and operational enhancements of that type were always encouraged. So I think it all began back in the early days of the company. The old adage is necessity is the mother of invention and there’s no pressure in the business world like the pressure of saying if we don’t solve this problem, we’re probably out of business in a month. 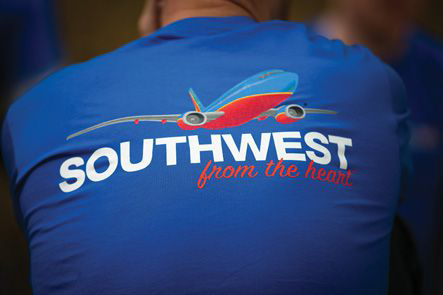 That creates the warrior spirit, that’s what we call it at Southwest Airlines. And we think it’s alive and well today. 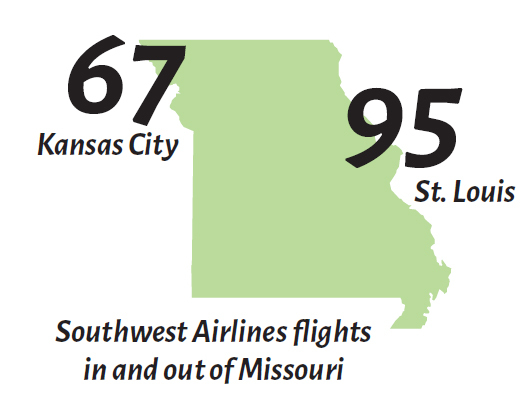 MB: In Missouri, the last decade has been a difficult one for air travel. St. Louis is no longer a major hub city. We’ve lost a significant number of flights and our passenger levels are way down. What’s your take on this? Ricks: One of the things that distinguishes Southwest in terms of our business model is we’re not what’s called a hub and spoke carrier. Most of the other airlines, if not all of the other airlines, that have tried unsuccessfully to serve Missouri on a large scale have been hub and spoke carriers. When I say serve Missouri, I mean on a large scale. They all failed, and in most cases, failed to the point of literally going out of business. The fact of the matter is neither Kansas City nor St. Louis are well situated to support the service level required to sustain a hub operation. Every hub carrier connects approximately two-thirds of their passengers but you have to have the remaining one-third of the seats filled with local passengers in order to sustain that level of service. Neither Kansas City nor St. Louis have large enough local markets to sustain a major hub. The business models just didn’t work. So why would anybody try to go in there now and try to replicate that? Southwest is a completely different animal. We’re not a hub and spoke carrier. It’s almost the reverse. Approximately two-thirds of the passengers who are flying Southwest Airlines are flying nonstop. And only about one-third are connecting. We are what’s known in the industry as a point-to-point airline. So we try to find, through market research and understanding our customers, where can we do the most good for the most people. And that led us to the system we have today in St. Louis and Kansas City. It works really, really well. MB: Despite all that, I’d bet you are still occasionally asked to bring a hub back to Missouri. Ricks: Yes, and when I get asked what it would take to get Southwest Airlines to create a hub in Missouri, I say, well, it depends on your definition of hub. Southwest Airlines is not going to create a hub and spoke network because it doesn’t work for Missouri as witnessed by all these other airlines that tried to do it and went out of business trying to do it. But let’s think about a hub differently. Let me put it in the form of a question to you, if you could attract an airline to St. Louis that gave you 670 flights a week to 35 separate destinations, nonstop, coast to coast, border to border—that’s almost 100 flights a day—would you consider that a hub? And every person I talk to in Missouri says, absolutely, that would be great. And then my answer to them is, congratulations, because that’s what you’ve got in St. Louis from Southwest Airlines and it didn’t cost you a penny. The same story can be said in Kansas City. The numbers are a little bit different but the point is the same. From our perspective, Missouri should stop wishing for a hub airline operation because it won’t be sustainable and instead Missouri should start doing everything it can to nurture the model that does work. MB: Southwest gets a lot of attention for its great customer service. There’s the slogan out now “if it matters to you, it matters to us.” That’s a nice slogan and advertising idea, but how are you getting your 46,000 employees to buy into that? Ricks: We do two things. First, we treat our employees as owners. And they are because virtually every employee—through their investment in the profit sharing fund at Southwest Airlines, and other ways—owns stock in the company. So they have an ownership mentality. Secondly, we communicate like crazy. If we are running a new ad campaign, like the one you just referenced, we don’t just push that out to customers. We push that out to employees. So we share the ads, we share the slogans, we share our plans for the future, our strategy. We share that with employees so that every employee is a walking, talking ambassador for the company. MB: At the same time, you have a heavily unionized workforce. Is that a challenge? Ricks: There’s no reason to duck the question, it’s a huge challenge. It’s a very, very difficult job to work with an organized labor force, particularly in the airline industry because we are regulated by a very esoteric federal law known as the Railway Labor Act that applies only to transportation workers. It’s about as quirky as you can get. It’s very difficult to administer, extraordinarily confusing and it’s very expensive. So how do we overcome all those burdens and challenges? The answer is twofold. We treat all of our employees, whether they are represented by a union or not—and by the way, well over 80 percent of our employees are represented by unions—with respect. We follow the golden rule: Treat people as you wish to be treated yourself. And secondly, our employees are by far are the best compensated in the industry, particularly when you factor in all of the benefits that we offer. Southwest has the highest wage scale in our industry by a significant margin. We’ve never had a furlough. We have a profit sharing plan. In fact, last week we announced that based on the profits we made in 2013, over $240 million was being deposited into employee retirement accounts. On top of that, we have the highest match in corporate America for 401k programs. On top of that, we have probably one of the richest health benefits packages available to employees, with one of the lowest copays. On top of that, we have unlimited free travel for airline employees and their families on a space-available basis. You put all that together, it’s a pretty attractive package for people. We also give them a successful place to work with a culture that rewards innovation and empowers people to take care of customers by doing the right thing for them. What’s not to like? So, yes, it is very difficult in a unionized environment, but we have been successful because we treat people well, they work hard, and we share the results of our success with the employees. MB: You’ve witnessed a lot of change during your career. Any ideas about what kinds of evolutions we can expect in the future? Ricks: It’s really hard to predict. If someone had told me 10 years ago that I could get on my Southwest Airlines flight today with this thing called an iPad, log onto WiFi and watch a St. Louis Cardinals or Kansas City Royals game live from 35,000 feet, at no cost, I would have said that’s pure fantasy. But that’s what you can do today. Who knows what the future holds? I don’t think we’re going to see revolutionary developments in terms of the planes we fly, the aircraft or the airports themselves. It won’t be like going from piston-powered airplanes to jet airplanes. But, you will see continued enhancements in the airports and aircraft experience. That said, my crystal ball is not that good. People in the industry, including those at Southwest, are working very hard to try to make incremental changes in the business to improve our customers’ experience. We are looking forward to continuing to gradually improve upon what is easily the safest and fastest mode of transportation ever known to man.